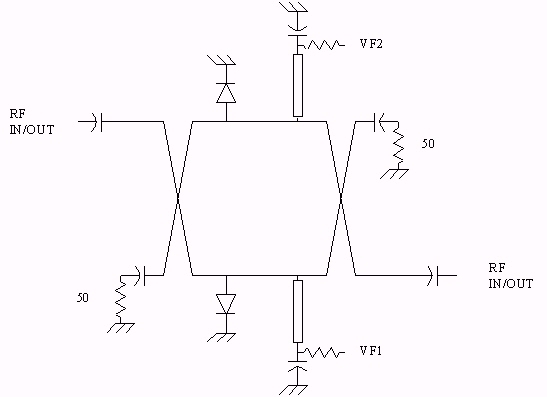 For variable attenuators, the resistors are replaced with solid state elements such as MESFETs or PIN diodes. 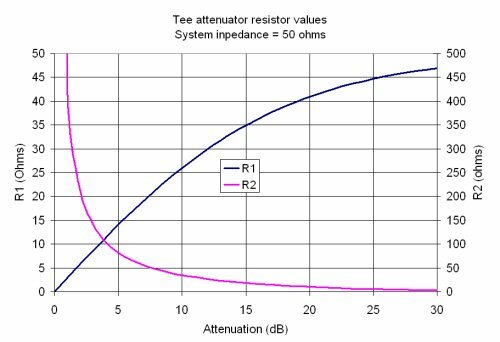 By controlling the voltage across the FET or the current across a diode, their RF resistances can be almost infinitely varied. The optimum control voltage values for a tee-type voltage-variable attenuator using MESFETs can be found empirically, by setting VC1 to a fixed voltage and then varying VC2 to achieve input and output impedance values of 50 ohms and constructing a table of attenuation value, VC1 and VC2. But who wants to do that when several vendors have solved this problem for you? 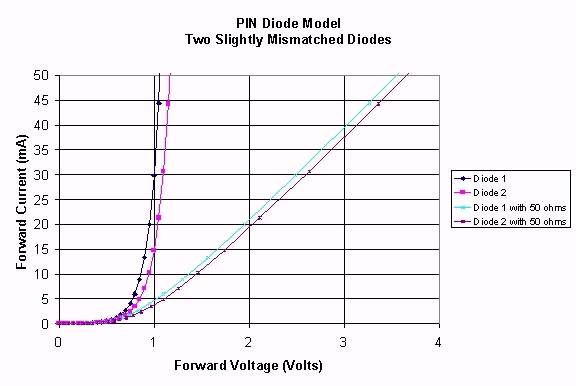 The requirement for matching diode characteristics can be reduced if series bias resistors are added to each diode. The figure below illustrates this point. Here a pair of diodes are mismatched by 100% (a very extreme case). 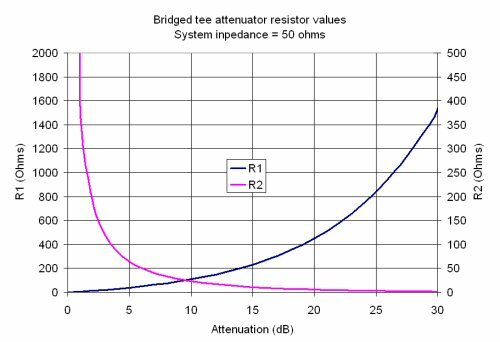 By adding 50 ohm resistors, the current mismatch is reduced to 5%. The only thing you trade for this is that more voltage will be needed to drive the attenuator. Another cool trick to try with balanced attenuators is to configure two diodes within each leg, at a quarter-wavelength spacing (four diodes total make up the attenuator). This can more than double the dB value of attenuation for a given current/voltage operating point. The load resistors on the quadrature couplers are needed to present a good match at high attenuation levels. Their VSWRs have only a secondary effect on the attenuation characteristic of the attenuator.